The What: Yamaha is now shipping the CS-700 SIP Video Sound Collaboration System. 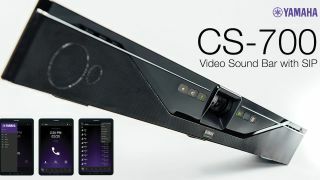 Part of Yamaha’s Video Sound Bar family, the CS-700 SIP model is the industry’s first video collaboration solution to integrate PBX and UC applications, according to the company. The What Else: The Video Sound Bar family features an adaptive beamforming microphone array; four Yamaha speaker elements to provide audio intelligibility; and a wide-angle HD camera for the far-end participants to see everyone in clear detail. The CS-700 SIP model introduces VoIP capability to the family, with built-in connections for VoIP and USB for UC applications. Users not only achieve clearer conferencing audio and video from any unified communications platform, they can also bridge VoIP and USB calls together directly from the device. This permits organizations to support both types of communication from a single wall-mounted unit, eliminating the frustration of operating additional audio equipment for more efficient and clear meetings, saving valuable table real estate in huddle rooms and other small conferencing environments, and allowing IT to quickly deploy, configure, and manage less hardware across an organization with the integrated network management system. The Bottom Line: With the CS-700 SIP, customers can bridge telephone calls and web conferences, achieving high-quality audio from all communication channels, addressing video and collaboration requirements, and streamlining organizational UC strategies with one easy-to-deploy device.